REPRESENTATION IN MEDIA AFFECTS THE ACTORS TOO! Crazy Rich Asians, a romantic comedy released on August 15, 2018 by Warner Brothers, has been the talk of the town ever since it came out. Many theaters are still showing it months later and several Asian audience members have come out with stories of how much this film means to them after years of discrimination and invisibility on screen. Why does visibility have such an impact on people who are not white, straight, and able? In this article, the cast and crew of Crazy Rich Asians is asked about their crazy experiences since the smash hit began production. To assemble the cast of “Crazy Rich Asians,” the filmmakers sent out feelers across five continents, watched scores of Skype auditions and held chemistry reads — something between an audition and a weird lunch date — to determine if actors were compatible. They looked at standup comedians and TV stars, models and musicians, and even announced an open call on social media. In the end, the film included Asian screen royalty (Michelle Yeoh), breakout stars (Awkwafina), newcomers (Henry Golding) and YouTube discoveries (Cheryl Koh). Here, six actors — and one singer — recall the casting process. Her online audition was something of a whim. A 21-year-old University of Southern California student at the time, Ms. Koh had never acted before, but her covers of pop songs on YouTube had garnered hundreds of thousands of hits. Recorded in her Los Angeles bedroom, her video audition features a minute and a half of Ms. Koh, who was born and raised in Malaysia, reading lines with a school pal, and about 15 seconds of her singing Jessie J’s “Mamma Knows Best” a cappella. “I just threw it in there,” she said. Ms. Koh uploaded the video in February 2017, and waited. And waited. A year later, after nearly taking the video down — “I was quite embarrassed of it” — she got a call from Warner Bros. You can hear her Mandarin and English version of the Beatles song “Money” as the opening credits roll. During the closing credits, Awkwafina adds her rap verses to the mix. The late Tyrus Wong, whose paintings formed the basis of Disney’s iconic film, is finally receiving the recognition he deserves. Even if you’ve never heard the name Tyrus Wong before, you’ve likely seen his work. Maybe not in a museum or gallery, but you’ve probably enjoyed the late artist’s fascinating brushstrokes ― or the films that they inspired ― in the comforts of your home. Until his death last year at the age of 106, Wong was considered America’s oldest living Chinese-American artist and one of the last remaining icons of Disney’s golden age of animation. Few people outside of his studio could identify him during his lifetime, but his art was eerily ubiquitous. Handpicked by Walt Disney to guide one of his films, Wong’s watercolor sketches formed the basis of “Bambi” and, later, Warner Bros.′ live-action movies like “Rebel without a Cause.” His calligraphic imagery wound its way onto Hallmark Christmas cards, kites and hand-painted California dinnerware. He did show in galleries and museums, too ― with greats like Pablo Picasso and Henri Matisse, no less. And yet, it wasn’t until recently ― later in his life ― that he began receiving the recognition he deserved. 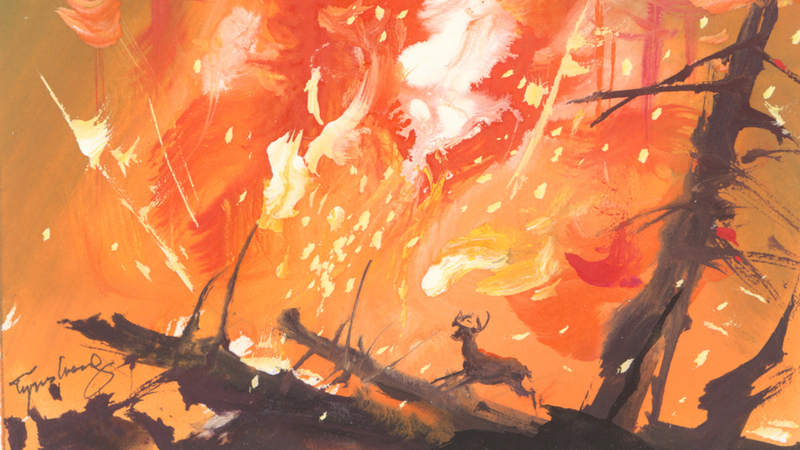 It was in 1942 when he painted a minuscule buck leaping through a forest felled by blazing flames, an electric landscape that would heavily influence the World War II-era movie about a fawn who lost his mother. Seventy-five years after “Bambi,” Wong is the subject of an “American Masters” film on PBS, a documentary portrait that reveals how he overcame a harrowing immigration process and years of racism in the United States to become one of the most prolific artists in recent memory. Her 90-minute documentary follows Wong from his birth in Canton (now Guangzhou), China, to his attempts to immigrate to the United States in 1919. Detained for a month, he, along with his father, endured extensive interrogation before being allowed to enter the country, only to live in poverty once they arrived. As multiple sources in the film point out, American society in the 1920s and ’30s was not kind to Chinese-American communities ― many immigrants saw only a few options for work, including acting as laundry men, house boys or restaurant staff. And the world of animation and film, a more than unlikely field Wong fought tooth and nail to enter, was not much kinder. Described as “an old boy’s club,” Wong recounts how he was called a racial slur on his first day with Republic Pictures. Today, immigrants in the U.S. continue to face astounding obstacles. Just a few days before the premiere of “Tyrus,” President Donald Trump and his administration initiated the termination of the Deferred Action for Childhood Arrivals protections, putting nearly 800,000 young undocumented immigrants at risk of deportation if members of Congress fail to strike a deal. Wong’s story illuminates just how difficult it is to succeed in a world that’s designed to test your limits at every turn. Ahead of the debut of “Tyrus,” HuffPost is premiering an exclusive clip from the “American Masters” film. For more information on the project, head to PBS.